OK, indeed. In 2015 Sheffield will have a Hall of Fame case for the BBWAA to consider. Just see how he compares to 2007 inductee Tony Gwynn. Both broke camp in their age 20 seasons, but they also played in under 110 games. Upton had 417 PA, Sheffield 405. But this tells the story a bit better. In those trades Sheffield was packaged with six players, while his then-former teams received 14 players. 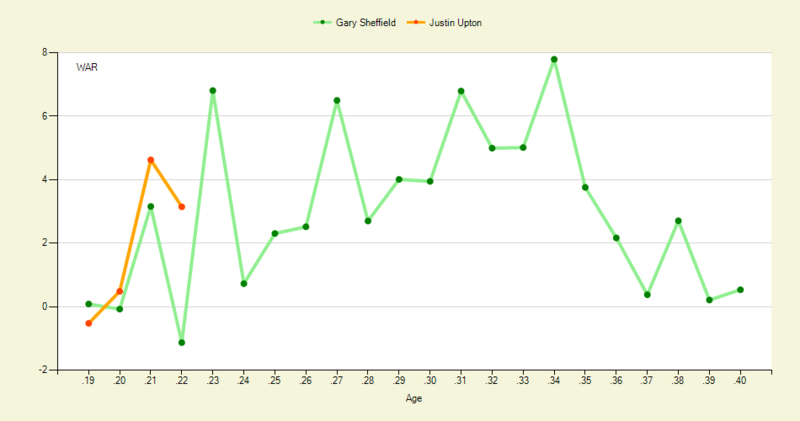 If Upton were to continue following Sheffield’s career path, what might we see? Which players would he fetch, if teams were inclined to act similarly? Here’s what each team got from Sheffield, and then in return for Sheffield. NOTE: This is a for-fun thing and is not meant as serious, definitive analysis. Clearly more goes into a trade than what I’m examining here. It’s more curiosity than anything. Padres get: Sheffield and Geoff Kellogg. The Brewers got four seasons out of Sheff, but they amounted to only 2.1 WAR, thanks to a poor 1991 season. From Bones they got 5.1 WAR in 4.5 seasons. Mieske stayed with the Brewers for five seasons, but produced just 1.1 WAR. In his career Valentin produced 32 WAR, but the Brewers saw only 11.3 of that in his eight seasons. The Padres traded Sheffield after just 1.5 seasons, but in that first season he was a monster with 6.8 WAR. He was at replacement level during his second season with the Padres. Berumen didn’t last even 50 innings in the majors, and finished with -0.3 WAR. Martinez had an even shorter career that ended with -0.1 WAR. Hoffman, of course, went on to become the all-time saves leader. In his 15.5 seasons with the Padres he produced 22.2 WAR. This one isn’t fair from the start, since the Marlins turned around and dealt Piazza to the Mets a week after getting him from the Dodgers. We’ll go with their return on Piazza, which was, sadly, Geoff Goetz, Preston Wilson, and Ed Yarnall — plus Zeile of course. In Zeile the Marlins got something of a steal. He was with them from just mid-May through July 31, but in that time he produced 1.3 WAR, which is solid. But the two players the Marlins received for Zeile never played in the majors. Goetz never appeared in the majors, while Yarnall was replacement level in his 20 innings. Wilson was terrible from the get-go, going 0.6 WAR into the red during his first season in Miami. But by the end of his nearly five-year stay, Wilson had produced 8.5 WAR. After the 2002 season the Marlins traded him for Mike Hampton and Juan Pierre, with whom they won a World Series in 2003. Let’s point and laugh at Preston Wilson. In about five seasons, Sheffield was worth 14.9 WAR to the Marlins. Perez and Jordan turned out to be a good return, the former producing 10.2 WAR and the latter 4.3 while in a Dodgers uniform. For their end the Dodgers got 19.5 WAR during Sheffield’s 3.5 seasons. Here Sheffield actually reached free agency, signing a three-year, $36 million contract for the Yankees. He missed most of that final season with a forearm injury, but the Yankees decided to pick up his option anyway with the intention of flipping him. But, before we get to the final trade of Sheff’s career, we should award points to the Braves. Of the three, only one remains in the Yankees system. Whelan has bounced around all levels, and at each he has had next to no control over his pitches. Sanchez didn’t do much during his two-inning cup of coffee, while Claggett was shelled in 2.2 innings, costing him 0.2 WAR, before the Yankees designated him for assignment. The Yankees did get some benefit from Sheff, though, but not much. And, of course we have the Tigers at 2.9 WAR and the Mets at 0.5 WAR, thus accounting for Sheffield’s career 65.8 WAR. Using this imprecise — nay, downright inaccurate — method of tallying value for a trade, we can conclude that other than the Yankees, who traded the Sheff when he was 38, the Brewers got the least out of Sheff. They might have thought they had legitimate reasons for dealing him. But they ended up dealing a guy who would end up in the Hall of Fame conversation. The point might be moot by now, since the trade rumors have dulled substantially. That’s probably because the Diamondbacks were never serious about trading Upton in the first place. I don’t blame them. I wouldn’t want to be the guy who traded the next Gary Sheffield. 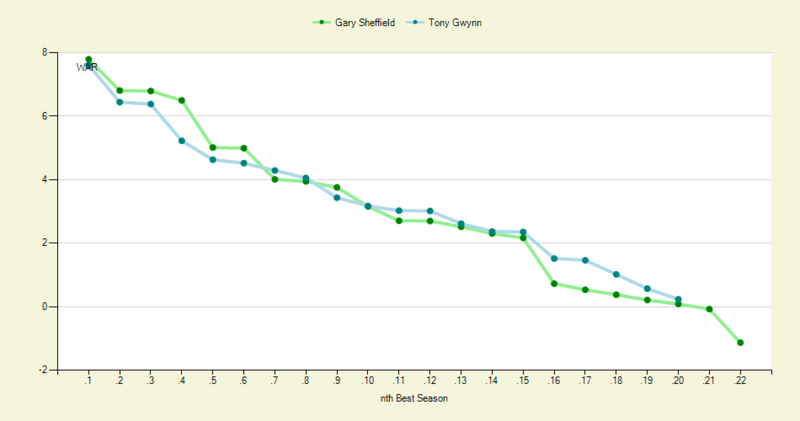 We hoped you liked reading Justin Upton’s Future Trade Value vs Gary Sheffield’s Career Trade Value by Joe Pawlikowski!